Lifetime Structural Coverage - LMR.com warrants its SVE Rear Control Arms to be free from Structural Defects for as long as they remain installed on the vehicle for which they were originally purchased under the ownership of the original purchaser. Structure refers to the actual metal control arms themselves and excludes bushings and attaching hardware. Two Year Finish Coverage - LMR.com warrants its SVE Rear Control Arms to be free from Finish Defects for a period of Two Years as long as they remain installed on the vehicle for which they were originally purchased under the ownership of the original purchaser. Finish refers to the actual red or black coating on th control arms themselves and excludes bushings and attaching hardware. 90 Day Bushing Coverage - LMR.com warrants its SVE Rear Control Arm Bushings to be free from Defects in Materials and Workmanship for a period of 90 Days as long as they remain installed on the vehicle for which they were originally purchased under the ownership of the original purchaser. Bushings are considered wear items and will need replacement under normal use. Bushings MUST be lubricated with a PTFE grease only. Any other lubricant will destroy the bushing. Damage due to misuse, neglect, chemical attack, or modification. Improper installation or installation with other than recommended accessories. Off Road or Racing use. Bushings lubricated with improper lubricant or not lubricated at all. Impact Damage to finish, such as a rock chip or marring from a tool or jack. 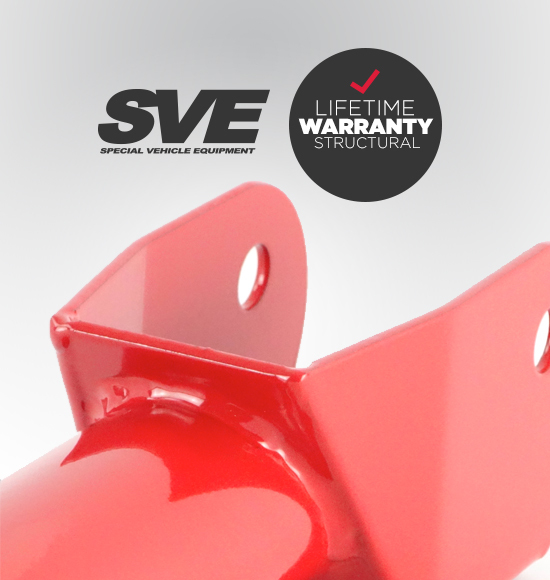 This warranty applies only to SVE Rear Control Arms which have been installed in accordance with accepted industry standards by a mechanically competent individual or a recognized service dealer and certified technician. Cost of removal, installation, and incidental or consequential damage are expressly excluded. A warranty claim must be initiated with LMR.com prior to any SVE Rear Control Arm return or replacement.